Posted by Brian Enright on Tuesday, April 16th, 2019 at 1:37pm. Centennial Park West is a popular building located in Downtown Atlanta. One of the biggest perks about living here is that you're just steps away from Centennial Olympic Park. Home to the 1996 summer Olympics, Centennial Olympic Park is a 22 acre urban green space featuring the iconic Fountain of Rings, gardens, walking and bike paths, and is host to many events throughout the year. View available condos at Centennial Park West. The Atlantic is the most luxurious building in Atlantic Station, a live-work-play mecca within the city. 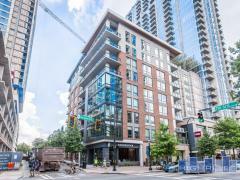 Conveniently, the Atlantic is located just a short walk from both the Atlantic Station Dog Park and The Foundry Park. View available condos at The Atlantic. Brookwood Park is a gated retreat located between Midtown and Buckhead. The building sits on 7 landscaped acres of land with plenty of amenities for an active lifestyle. In addition, the grounds are home to an enormous outdoor recreation area for residents to walk, bike, or jog, or just enjoy being outside. View available condos at Brookwood Park. The Mayfair Towers & The Mayfair Renaissance twin luxury towers in Midtown. While the development features many high-end amenities, one of the best parts about living here is the close proximity to Piedmont Park. Piedmont Park is an expansive 200 acre green space that hosts events, has miles of paths perfect for walking, jogging, or biking, has all different types of sports facilities including swimming, tennis, and basketball, and is one of the top dog parks in Atlanta. View available condos at The Mayfair Renaissance & Mayfair Towers. Luxe Condos is easily one of the most sought after addresses in Atlanta. Located just one block from piedmont park, Residents of Luxe enjoy walking to the Green Market on weekends or enjoying any of the outdoor activities that come with have Atlanta's premier park as your backyard. View available Luxe Condos.